Nuclear War Now! 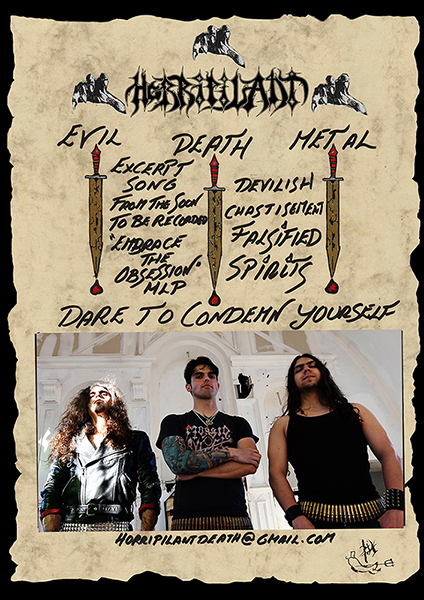 Productions :: View topic - HORRIPILANT (Spa) - Falsified Spirits adv. track cassette. HORRIPILANT (Spa) - Falsified Spirits adv. track cassette. Posted: Mon Mar 11, 2019 1:43 pm Post subject: HORRIPILANT (Spa) - Falsified Spirits adv. track cassette. We introduce Falsified Spirits, excerpt track from our soon to be recorded "Embrace the Obsession" debut MLP. Registered at the 7th Church Studio in Valencia (Spain), during November 2018, year of our foundation. Total support to these fellas, can't wait for the MLP. Sounds very promising, I like the Possessed vibe! David, te deje un mensaje en tu Bnadcamp!! Tapes going out really fast, act now!!! Good stuff from the motherland, soporte total! !